Fleeing religious persecution in France in the 1700s, more than 200 French Huguenots arrived in the Cape and were settled in the valley that soon became known as Franschhoek (French Corner), which is today situated in the heart of the Cape Winelands region. 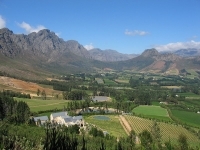 Many of the settlers were experienced wine producers and they soon recognised the potential of the region for wine and fruit production, establishing wine estates throughout the spectacular Franschhoek Valley in surroundings of magnificent scenery and towering mountains. Today the town is famous not only for its splendid wines and beautiful vistas, but also as the gourmet capital of South Africa, boasting the highest number of award-winning eateries in the country. Restaurants such as Le Quartier Français, La Petite Ferme, Haute Cabriere, and Boschendal are among those that are internationally acclaimed. The Huguenots also left behind a rich legacy of arts, architecture, and hospitality, which are still visible today. Franschhoek hosts a number of wonderful festivals, including a book fair, a big celebration for Bastille Day, and champagne and wine tasting festivals.